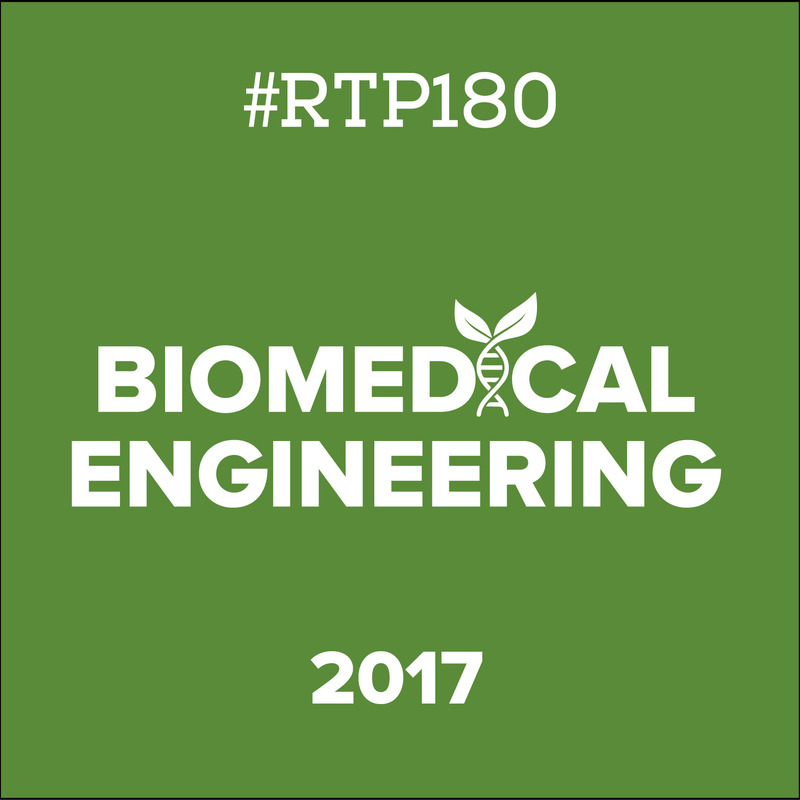 I’m no rocket scientist, which for this month’s RTP180 topic plays in my favor, however we still dive deep into the wonderful world of Biomedical Engineering. One thing I did discover is that Biomedical Engineering is one of the rare topics where you can pack (pun intended) NC State folks in a room with UNC patrons and a fight not break out. I joke, I joke, but both universities are extremely fond of biomedical engineering and share a deep passion for research and breakthroughs coming out of the field, which is an awesome phenomenon to witness. We often hear so much about the rivalry between these two schools that it’s easy to forget how close they work together to produce incredible work. It’s truly what helps make this region great. The first speaker to grace the 180 stage this month was Mr. Andy Taylor from The Medical Innovators Collaborative (MEDIC). Andy, sporting an amazing playoff beard (a beard grown during a team’s playoff run until that team is eliminated), was born with a condition known as Neonatal Jaundice which is a liver condition that causes yellowing of a newborn baby’s skin and eyes. Two-thirds of infants develop jaundice, and one-tenth of those cases lead to disability or death. Each year around 100,000 infants become disabled or die from this disease, but the treatment is simple. Shining a blue light on the baby’s skin causes the bilirubin to spin a certain way leading to excretion. The machine that typically carries out this procedure ranges from $4,000 – $6,000, with expensive bulbs that need to be often replaced. Along with several other classmates during Andy’s senior year in college, together they prototyped the “BiliSol” which cures jaundice by using the blue light that the sun naturally produces. The best part? Their machine only cost $100 to build. But, after graduation everyone that worked on the project went on to other things leaving the Bilisol sitting on the shelf. When it comes to innovation in North Carolina – we are 5th in federal research funding and 23rd in venture capital dispersion, which is below average. This is what inspired Andy to create MEDIC, to help bridge the gap in the medical industry between innovation and lack of funding. For the secret sauce on how they do this, you’ll have to watch Andy’s talk here. Mimicking nature to promote healing is called Biomimicry. This approach to innovation seeks sustainable solutions to human challenges by emulating nature’s time-tested patterns and strategies. For example, using birds to inspire airplane design and the structure of gecko feet in architecture to create super strong adhesives. Dr. Brown’s company also engages in mimicry by studying natural blood cell properties, specifically platelets to help create products that control bleeding and wound healing. Blood loss due to trauma is one of the leading causes of death in people ages 5 – 44, which makes for a greater call to action for what Dr. Brown and team are working on. To learn more about their research and findings, you can watch her RTP180 talk here. A lot of people play sports which is great, but it also means an increase in injuries, and this is where Matthew and team come in. They are tasked with the challenge of researching musculoskeletal tissues in relation to sports injuries. As an engineer, Matthew thinks in terms of “How do we treat injuries, how do we prevent injuries, and how do we minimize the pain or effects long-term due to injuries?” As an engineer and scientist, he also wonders “How do musculoskeletal tissues grow and mature?” With two young kids at home coupled with teaching undergraduates, Matthew jokes that he certainly sees growth but maturity is debatable (crowd laughs) in these two groups. To study musculoskeletal tissue, Matthew and team take a basic science approach by looking at tissue anatomy, joint function, and intrinsic changes. Visually, think of a Venn diagram, where all three overlap and come together in the center. For a deeper dive and better explanation of how all of this works and comes together, watch Matthew’s talk here. As Dr. Franz (the director of the Applied Biomechanics Lab at UNC) takes the stage, he prompts the audience to raise their hand if they have older relative that has lost their independence or has fallen. This question ties perfectly into what the Applied Biomechanics Lab studies. At the lab, researchers explore the musculoskeletal and sensory motor adaptation that contribute to the loss of independent walking ability, and orthopedic injury or acute neurological injury like stroke or a neurodegenerative disease. By better understanding the mechanisms governing these changes, Jason’s team can develop new and better ways to counteract these changes. The ultimate end goal is to restore mobility and mitigate high-risk falls in aging adults. To entrench yourself in the lab’s studies, you’ll have to watch Dr. Franz’s 180 talk here.